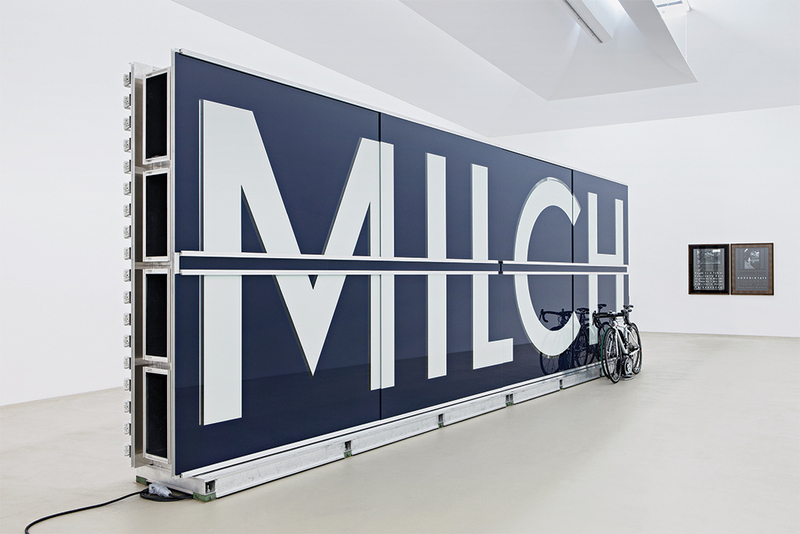 View of “Reinhard Mucha,” 2016, Kunstmuseum Basel. Left: Ohne Titel (Milch)—1:1 Modell des ausjurierten Beitrags zu „Kunst am Bau—Eingeladener Wettbewerb“ für die Volkswagen Universitätsbibliothek der Technischen Universität und der Universität der Kü nste Berlin 2004 (Untitled (Milch)—1:1 Model of the rejected proposal for “Kunst am Bau—Eingeladener Wettbewerb” for the Volkswagen University Library of the Berlin Institute of Technology and the Berlin University of the Arts 2004), 1979/2014. Right: BBKEdition, 1990. Photo: Gina Folly. © Mucha, VG Bild-Kunst, Bonn. THE LOWLY FOOTSTOOL: No element is more primary to the practice of German sculptor Reinhard Mucha than this. Fußbänkchen (to use the German plural) inhabit Mucha’s work in myriad guises. They stand firmly, perch precariously, lie flat on their backs with their legs in the air. In each case, the artist has noted, the footstool stands as a metaphor for his own labor. “In the hierarchy of service furniture,” he observes, “the footstool is at the bottom. . . . This matches approximately the service I am offering as an artist.”1 Much as a stool facilitates the connection of a hand with an out-of-reach lightbulb, Mucha’s role, as he himself understands it, is to elevate and extend the reach of his works’ disparate parts. These include everything from wooden doors and discarded metal tubs to linoleum flooring and battered suitcasesall of which he assembles into dense ensembles.